Roll20 and Paizo, Inc have announced a partnership to bring Paizo’s Pathfinder and Starfinder roleplaying systems to Roll20. The first fruits of this partnership begin bearing today, with the release of the official Pathfinder character sheets for Roll20 Pro subscribers. The sheets will roll out to everyone on March 22. 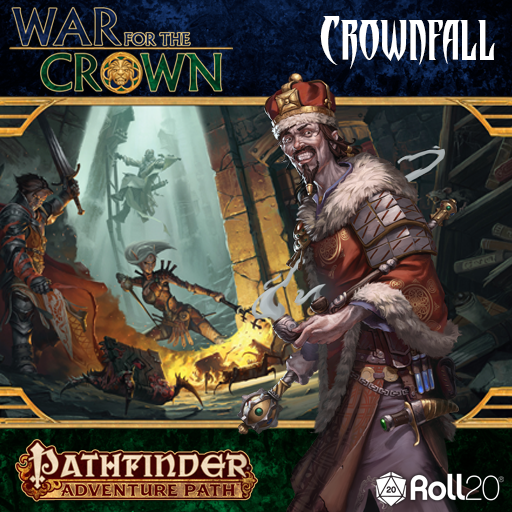 March 22 is also the launch of the first official Pathfinder module, Crownfall, the first volume of the new War for the Crown Adventure Path. Crownfall is available for pre-order for $27.99. It includes over 40 NPC character sheets, 11 pregen PC sheets, and 4 maps with pre-placed tokens and dynamic lighting. Look for my review on launch day! Future volumes of War for the Crown will be released as addons that can be directly added into Crownfall. I played a bit of Pathfinder a few years ago, and enjoyed it as a facsimile to Dungeons & Dragons 3.5 edition. But I’m particularly excited for Starfinder content. Not only is it the brand new hotness from last fall (read my review of the Starfinder Core Rulebook), but D&D lacks a quality sci-fi equivalent. Look for more Roll20 Starfinder, and Pathfinder, news and modules throughout the year. In related news, Roll20 recently celebrated surpassing the three million mark with a big update. The video and voice chat WebRTC has been improved, the marketplace has been redesigned, and the Compendium has been upgraded for easier searching and filtering.